Fit 4 Two: What do the babies do? We are often asked...."What do the babies do at class?" Good Question. 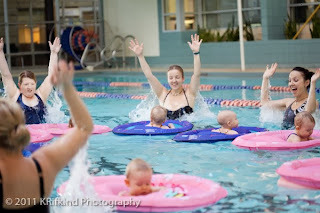 At our indoor classes....some babies will be asleep, some will be content in their stroller/carseat, others will be stretching out on the baby island (large mat in the centre) and others might be in mom's arms/carrier. Some moms like to bring chairs and toys. Left: Babies Veronica and Ethan three years ago. Babies & Moms still BFFs. At Mom & Baby Spin and Strength, the babies hang out on mats in front of the bikes. Some prefer to stay in their strollers. When mom hops off her bike for strength intervals, she can incorporate baby as needed. Our mantra is happy mom = happy baby. 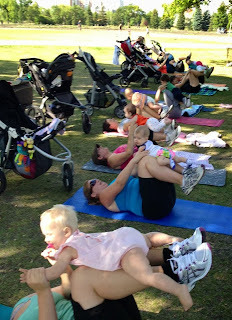 At our outdoor classes....babies stay in their strollers until the core and stretch portion. With the fresh air and movement, the sleeping babies tend to stay....well...asleep. They awake babies also love being on the move and watching us moms entertain them as we exercise. We aim to use equipment rather than baby for resistance whenever possible because you need to strengthen the muscles that you do not use all day and lengthen the muscles that you do use all day. However, if a baby needs to be physically incorporated, and there is a safe way to do that, we do that too. The last 15 minutes of class is dedicated to core work and stretching. 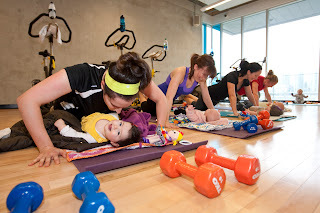 This is a great time to incorporate baby into the workout. Other ways we interact with the babies is through songs, chants and entertaining exercise drills. Babies also love to look at the other moms and babes. At Mom & Baby Aquafit, babies are either in moms arms or in a baby float. This class is currently being offered in Winnipeg. If you are feeling nervous about attending your first class with baby we have important news for you. You are normal! Just come on out and try a class. You'll be glad you did. Classes begin Jan 6. Find a class near you. Answers to more FAQs here.